Try keeping your barracuda flies right on top so that the turbulence and surface glare help hide the wire bite tippet. ‘Cudas will often track flies presented just below the surface all the way to the skiff without striking. MANY OF THE QUESTIONS that I field from other anglers concern casting — not only how to but also where to. The truth is, fly placement depends as much on the circumstances as it does on casting mechanics. Just as you have to adjust your casting motion to account for wind, obstacles, and distance, you need to calculate fly placement depending on the species, the direction the fish is traveling, and what the fish is doing. For example, you present a fly to a black drum tailing 25 feet away in off-color water much differently than you cast to a laid-up barracuda in gin-clear water 75 feet out. In short, the magic “right place” is constantly changing. But there is a definite wrong place. No advice about fly placement is worth its salt unless one thing is clear: Do not place the fly in a position that will force you to retrieve it toward the fish. Prey, or in this case your fly, is supposed to flee from the predator, and if it is moving toward the bigger fish, the predator will spook as quickly as if you had dropped the fly line over its back. I’ve seen many a tarpon spook from a skimpy four-inch streamer. Whenever a stripping retrieve is involved, you want your fly moving away from the fish. Critical fly placement comes down to being physically and mentally ready to make a great cast. So, before you’re on the bow with a huge tarpon moving toward you, make sure you’ve done all you can to improve your casting accuracy and to have a mind set on what should happen. Whether you’re a novice or an expert, practice will improve your casting, and you should always practice with a fly. I’m not talking about a little piece of fuzz, but a 1/0 Sea-Ducer or something else substantial, something that will allow you to see the fly turn over. Clip off the point so it will not hang in the grass, and that way you can practice the complete cast and simulate a genuine fishing situation. Also, remember that this is not target practice with a set of rings or loops. Instead, you need to “see” a fish or school of fish and practice placing the fly in front of them. It’s like leading a wide receiver with a pass, except that fish aren’t running some play with a fixed route. Train yourself in to placing the cast in front of moving fish at a distance that matches their speed and depth. Like any athlete honing his skills, visualize the situation and the perfect result. I practice casting to a bonefish pillow that Flip Pallot gave me many years ago, but you can just as easily use a stick. Mark or paint one end of it so you can distinguish the mouth side from the tail side. This will show you where the fly is landing in relation to the fish. You’ll also need to practice making casts at different distances. If you’re going to be fishing for redfish in muddy water, practice making accurate casts that are no more than 20 feet. But if you’re going to be chasing permit in Key West, you’ll want to try improve your accuracy up to 60 feet or longer. This will help ensure that you don’t blow an opportunity when it starts swimming your way. Before you determine where you want to cast, think about the species of fish in your sights. The depth of the fly should match your quarry’s preferred feeding method. 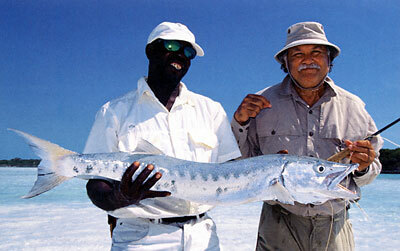 For most bottom-feeding species, such as bonefish and permit, the fly should be at the fish’s level or below it. In the case of tarpon, with their upturned mouth, the fly needs to be at the fish’s level or above so that it can rush the fly or rise to it. For redfish, try to present the fly at eye level or below. Sometimes, though, reds will move up to crash a Muddler on the surface or even a popper. So will snook. For a shark, I like to make only medium or short casts and pass the fly (preferably a big orange Muddler) by one eye or the other. I can’t prove it, but I think a shark can see a pattern cast to its side better than one cast in front of it. For barracudas I want the fly right on the top, primarily because the fast retrieve coupled with the surface glare will help hide the wire shock or bite tippet. On many occasions, if the fly is a foot deep or deeper, and the heavy tippet is exposed, a big ‘cuda may follow to the skiff but never take. You’ll also want to consider the angle of the fish in relation to your position. When sight-casting, the best shot usually is at a fish moving toward you. If he is a good ways away, say 30 feet or farther, lead him by a yard or so and let him come to your fly. Even if you are stripping the fly and he chases it, he will still be far enough away that you are probably in no danger of spooking him. If he is much closer than 30 feet (depending on visibility), cast ahead of the fish but to the outside of its area of awareness, say 45 degrees to either its left or right. That way, the fish will have to turn to see the fly, which will decrease the likelihood of it spotting you. Let it swim toward the fly before you start stripping. If the fish is at a right angle to you, cast in front of it but not beyond. If you cast past it, you’ll be forced to strip the fly toward the fish. Also, remember that the fish’s area of awareness depends on a variety of factors, such as its swimming speed, and the depth and clarity of the water. A fast-swimming fish needs a longer lead than one taking its time. If the fish is swimming a bit deeper, you may want to cast far enough ahead to give the fly time to settle to the right depth. Big reds or big bones in three feet of water need a good lead. I make an exception for permit. I want permit to see the fly drop, so in deeper water, I like to cast aggressively. Some fish are just lying there, or “laid up” as tarpon anglers say. But redfish, snook, and many other species do the same. In cases of a laid-up fish, you should put the fly very close — a foot, even inches away — to get the fish’s attention. And when the cast has landed just right, move the fly very slowly just enough to make it breathe for a few seconds. Barracudas laid-up on the flats are an exception. Lead a big ‘curia by 10, even 20 feet (he can see everything in that clear water), and approach barracuda with the wind at your back so you can cast from as far away as possible. Barracudas don’t like to be crowded. For me, 60 to 70 feet is minimal, but I’ve taken big ‘cudas that required casting nearly the entire fly line. In addition, a barracuda will often follow a fly a long way before taking — you want him to make up his mind before he sees the boat. is not unusual to make a half-dozen close, quick casts to a redfish before finally hooking him. And if a red, snook, or baby tarpon in muddy water does not react to a closely cast fly, try presenting the fly to one side, near its eye. That usually gets his attention. When a fish is tailing, it is feeding with its head close to or against the bottom. There are several factors working against you here. First, the fish’s area of awareness is only a few inches. It’s also focused on getting its prey, and it is nervous due to the shallow water and vulnerability to predators. So, you must place a careful cast, often within a foot or less, and quietly enough not to spook it. If the fish has its face buried in the grass, you may have to practically knock it in the head to get a response. Fortunately, with its attention diverted, you can stalk very close to your target and make repeated short casts, especially if the water is off-color or muddy. And you’ll typically want a weighted fly that will dive down to where the tailer is working. While making these repeated casts, try to figure out which way the fish is headed — usually against the tide or wind. If you can anticipate its next move, reposition yourself and cast repeatedly until you hook up. Also, if you think you know the fish’s line of travel, cast the fly a couple of feet in that direction and have the fly waiting on the bottom. If the fish moves toward the fly, twitch it a little here and there, but not much. This sometimes works miracles on stubborn fish. If a red or bone is tailing and moving, tailing mid moving, wait until it ceases tailing and starts cruising. Then cast to it. Finally, one last bit of important advice: The best place to cast the fly is wherever you know it has to be to get a response. Don’t be too careful; if you do, you are going to miss a lot of fish. Take a risk. If you know it has to be a foot from his nose, go for it.